So I bought a custom Timbuk2 shoulder bag to act as my purse on our recent Europe trip because it was big enough to fit a water bottle, kindle, guidebook, camera lens… and more. It arrived the night before we left. 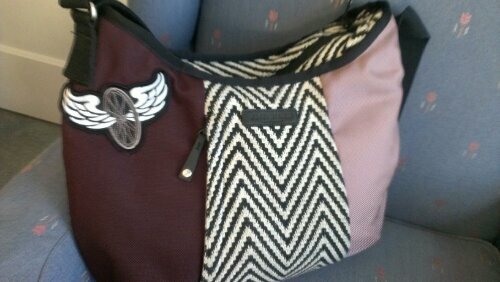 Strangely, it had a twisted strap that I hurriedly fixed so the bag would still work. 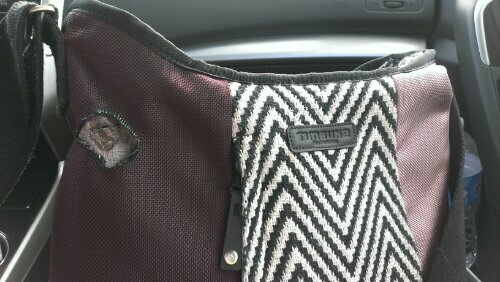 Timbuk2 and their perpetually great customer service gave me a partial refund for their mistake. Yay! My new bag took off for Ireland with me. I looked for a patch to cover up the hole for the rest of our trip but only found patches that were orange and green, and they didn’t look that great on my bag. 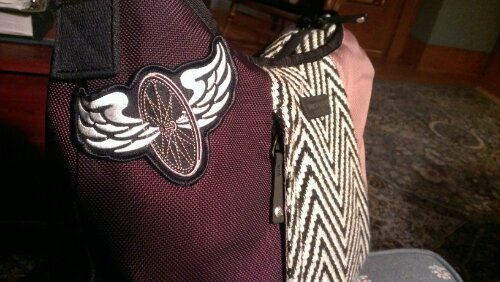 Very soon after our vacation I was reading Bicycling and they conveniently had a blurb about patches, with one that matched my bag perfectly. Doesn’t it look great?? Perfect choice! If I hadn’t have seen the damaged bag to start with, I’d have assumed the bag came that way. It’s a wrap – 10 years of Bike MS! My Bike MS ride is next weekend!